Update: This post has sparked a discussion over at The Battle of Gettysburg Discussion Group. J. D. Petruzzi, who is an adviser for the film project, is apparently not happy with my comments. I admit that there is much I don’t know and I accept that the script has met the high standards set by the advisers, but in the end what stands out to me is that after four-plus years this film is no closer to being made. 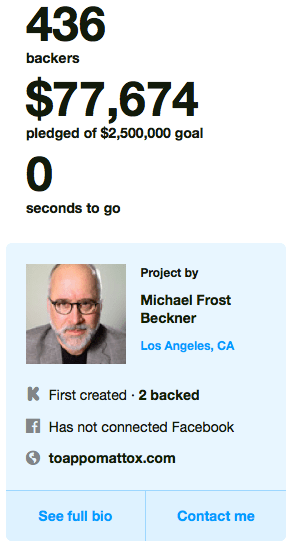 This failed Kickstarter campaign speaks volumes regardless of J.D.’s whining. It’s unclear whether Ron Maxwell intends to employ a crowdfunding campaign for his next project. The producers of “To Appomattox” recently attempted to raise money from the general public through Kickstarter and failed to make even a small dent in their goal of 2.5 million dollars. [The contributions of four totaled $30,000.] I am not surprised. I first heard about this production back in 2011 and there was a lot of buzz. Producers managed to attract a fairly impressive cast and a number of historians/bloggers signed on as advisers. You may remember their attempt to brand the project with the backing of NASCAR, which at the time I thought was somewhat curious. The fundamental problem from the beginning was that the producers set out to make a film for the Civil War community. That’s not the way you do it. You make a film that tells a compelling story that will attract moviegoers or keep viewers tuning in over the course of a few weeks. Band of Brothers was not made for the WWII community. Spielberg’s Lincoln was not made for Civil War buffs. I will be very surprised if we hear anything more about this project. For now, let’s not write this off as another example of our supposedly “anemic” sesquicentennial. This was likely a mismanaged project from the start. I was actually fairly interested in this project when it was attached to HBO (I think) but the NASCAR tie-in was the first sign that it was in serious trouble. I’m also pretty sure their website listed John Y. Simon as a historical adviser years after he’d died. Totally not surprised that it failed. It seemed as if their only advertising for the Kickstarter campaign was via Facebook. Every time they’d post about it (nearly every day) they would neglect to put a link to their Kickstarter page in the post. I brought this up to them, and then they started linking to their own website for the film. I’ve supported Kickstarter campaigns before, and even launched my own (which was funded), and I was still confused as to what they were doing and why. If they even begin to run a sensible Kickstarter campaign, how can they expect to make a movie or miniseries or whatever they were trying to do? I never understood the NASCAR tie-in, or why that was supposedly integral to crafting a work of this type. But I was impressed by some of the advisers who had been lined up for this, who have had some good things to say about their experiences with it. The movie has a wonderful list of historical advisers, all of whom I highly respect. I was thinking that might be what Ron Maxwell was up to. I think most reenactors figured out by now that a film company will pay them to be an extra, not the other way around. Without reenactors they have to first rent the costume then hire the extra. I suppose people might give more if they knew a particular story they are fond of was going to be told. I am no expert on what goes into a successful Kickstarter campaign, but it doesn’t inspire much confidence if after four-plus years you are asking for an investment of $2.5 million from the general public. I am still waiting for the T-shirt I won from J. D. when I helped them do some research for the movie. Good thing I have other T-shirts, four years is a long time to wait. You’d have a lot easier time covering much the same ground with a movie about Grant. The title would sure be a lot easier for people to understand, which is actually a serious consideration. And it would have a central focus. There would be some great scenes, like Grant at Shiloh in the rain under a tree muttering to himself, “Not licked by a damn sight” after the first day. There would be some great supporting roles, like Sherman. That’s the movie, if I were a filmmaker, that I would make. But more importantly, I believe that’s the movie someone not a Civil War buff would go to see. As much as I enjoy the “battles & leaders” aspect of the war, I never enjoyed “Gettysburg”. I think part of the reason Civil War movies fail, even with some people who naturally would be sympathetic to them, is the events come to life through books in our mind’s eye. Reenactments and stirring music just don’t capture what we know from books, and the overuse of both give the scenes a sameness. And no matter how authentic the reenactors are, you can’t really capture how violent and confusing combat was, and how little soldiers could see and hear. One final word on Civil War movies. Was there ever a more unintentionally funny one than Santa Fe trail with Ronald Reagan and Errol Flynn taking on John Brown at Harper’s Ferry? The inaccuracies rise to, dare I say it, historic levels. I’ve always thought Russell Crowe would make a good Grant. I don’t know enough about the series to have an opinion. I would have watched it if it had been made, though. I did read the comments on the GDG and found them puzzling. There was a lot of talk about how films about the Civil War and history generally don’t get made. Of course, two critical successes over the last two years were “Lincoln” and “12 Years a Slave.” Good stories with involving characters from the Civil War Era are being made into films. Also, documentaries like “Death and the Civil War” and Ken Burns’ new Gettysburg Address film have not only gotten made, but have excited a lot of discussion in the media. People have spent almost a quarter of a million dollars to see the two films at theaters. Failure to raise 2.5 million bucks on kickstarter says very little about the marketability of Civil War films. I think we are just worried that if “fans” have too much input we might end up with a neo confederate romance. You can fund just about any movie if you have a large enough special interest group behind it. For example they could put a Christian slant to it and get churches to back it if they wanted. maps and photographs to demonstrate that Paris is nowhere near any ocean. I suppose the lesson we should learn from that is never underestimate the power of the lost causers. It’s why Duck Dynasty got it’s funding back, their viewership was made up of equally prejudiced people who actually agreed with those comments he made. I’m thinking that if they wanted to do “Band of Brothers” or “the Pacific” for the Civil War, their aim was too high. Too many generals. The appeal of BoB and tP is the experience of and focus on the common dog-faced GI. My favorite Civil War movie: John Ford’s The Red Badge of Courage. I also like Gettysburg and Glory, but Gods and Generals not. very disappointing…Was looking forward to this production. Have been following it for a few years now. I am sorry to hear this production is not going to be made. Anybody associated with Gods and Generals (in my humble cowpuncher opinion) would not be an asset in making a movie. That was a great story that from a movie making standpoint was not very good. I agree it would need to be made with the quality and realness of Band of Brothers. Hope somebody talented gets a hold of the project.